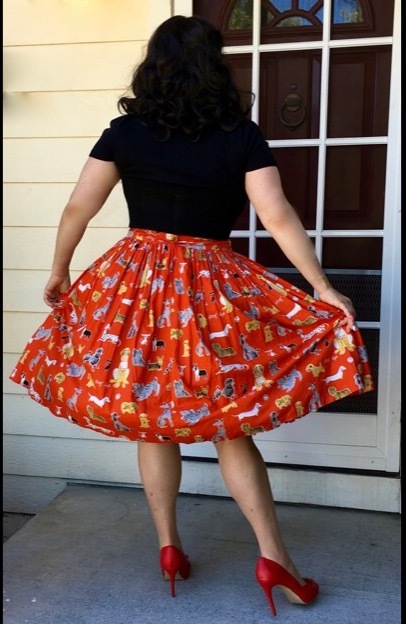 In a recent post I wrote about my visit to the Bernie Dexter pinup rockabilly store while on a trip to Oregon and shared how I’ve never had good luck fitting into Bernie Dexter styles. My very first photo-shoot was in a Paris style and it was tricky getting my breasts into it so, I didn’t think Bernie Dexter dresses were made for serious curves and large breasts. I was always a bit saddened because the prints are stunning and so many gals gush over their Bernie Dexter dresses but, they didn’t work on my body…until today when the awesome and helpful lady working at the Bernie Dexter store handed me a rare gem to try on in a magical style called Chelsea!!! 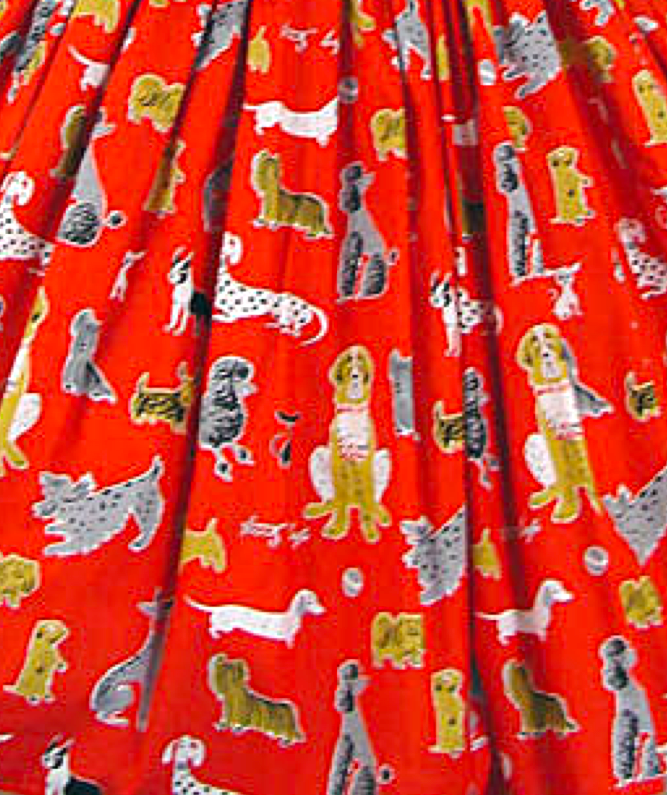 I had come into the shop wearing a vintage style dress with poodles on it so the print of this Chelsea was perfect; it was the Red Dog dress with many dog breeds as the print. The lady at the shop told me the dress came from their London location recently. I slipped the Chelsea on and my-oh-my was I pleasantly surprised. The fit was the very first thing I noticed…. especially the part that my well-endowed bosom fit into the dress. 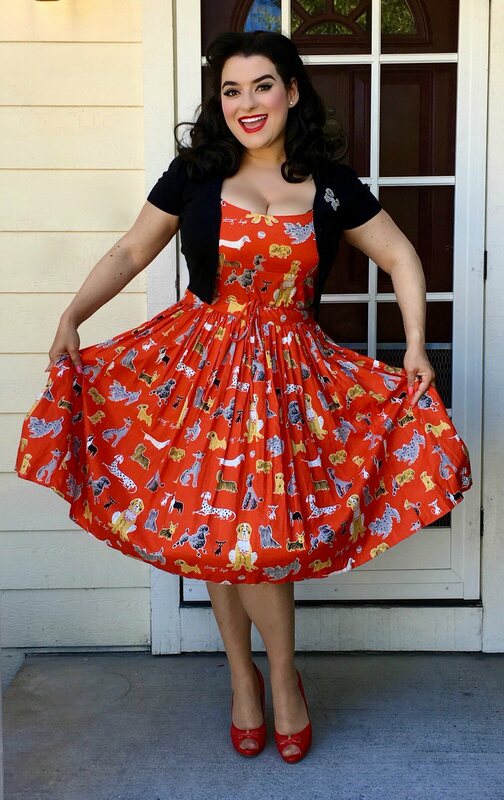 Next, I noticed that this dress reminded me almost immediately of the Jenny dress from Pinup Girl Clothing of which I own several. The Chelsea dress is made of a very light weight cotton fabric and I found the very lightness of it to be fun and flirty and with the addition of a petticoat perfect, the dress does not loose shape or structure. The fabric lightness is ideal for summer. Next I noticed the dress has an attached tie-belt, which is fabulous for nipping in the waist. I am wearing the Chelsea in a size 2XL and although quite roomy in the waist, the belt takes care of it. The dress was incredibly comfortable and I did not feel like my breasts were squished at all. I could easily spend an entire day in this dress. I felt like a bombshell!! My only wish would be the addition of adjustable straps and then you could decide how much or how little breast would show. 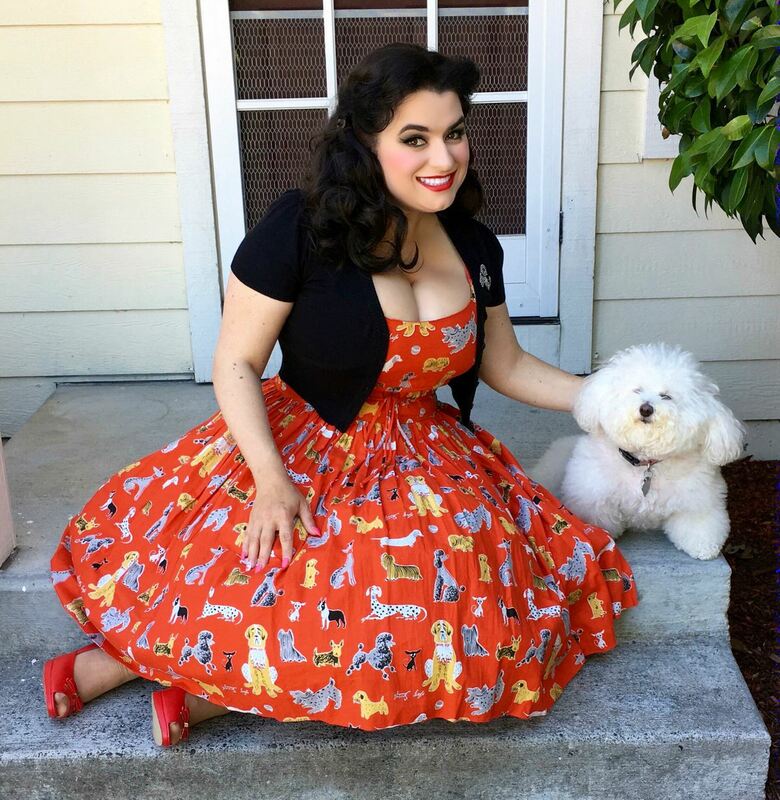 Here are some pics of me with my puppy dog Luna, how fitting right, since the dress pattern is all about dogs, yay!! 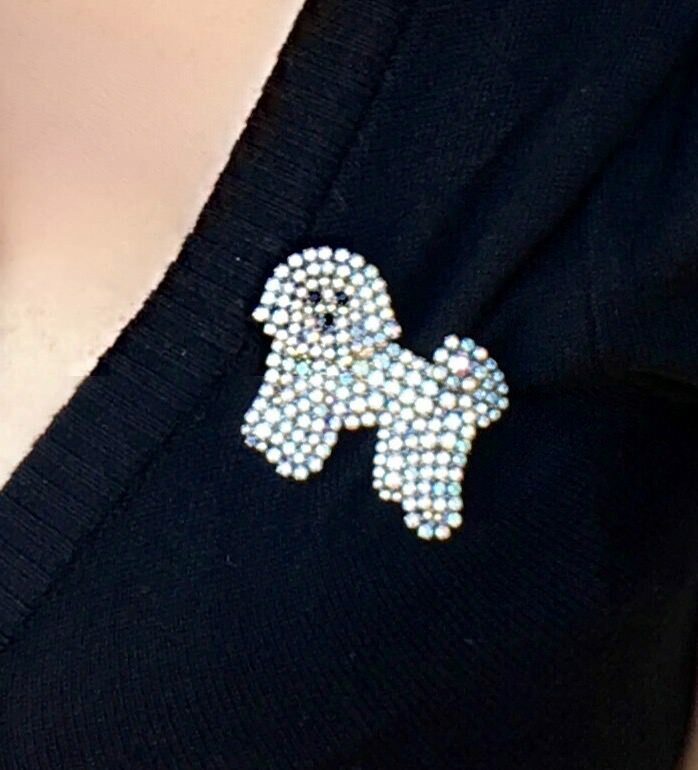 I styled the dress simply with only a petticoat, cropped black cardigan, red shoes and my sparkly rhinestone Bichon Frise puppy dog brooch because my Luna is a Bichon Frise. 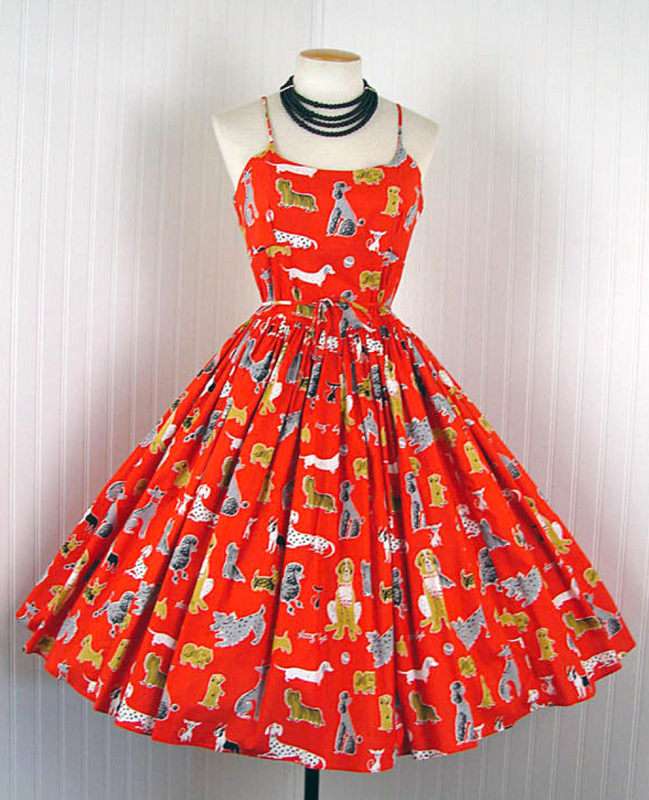 For a day to evening look I would add a lovely vintage purse with Poodles on the front. Adding a lovely vintage mustard yellow cardigan and pair of shoes would look fabulous as well. I look forward to adding many more figure flattering Bernie Dexter Chelsea’s to my wardrobe and I am confident I will be Pinup perfect! !